Brentwood High School celebrated homecoming on Friday, as football played Red Bud. Students also danced and named their homecoming kings and queens. The Eagles lost the football game 46-24, making the team’s record so far two wins and four losses, according to St. Louis Post-Dispatch. Also, on Thursday, Eagles senior softball players were honored at their home game, which they won 16-6 over Cleveland, to finish their regular season at eight wins and five loses. We are anticipating a huge crowd. The Brentwood Eagles jumped to a 19-7 lead in its Class 2 state semifinal game against Centralia, in Centralia on Saturday and never trailed. It was a nail-biter at the end though, according to the St. Louis Post-Dispatch. Central forced a punt an Eagles punt with minutes to play with the score 27-20. quarterback Skylar Sappington booted a perfectly-placed punt on the Centralia 1-yard line. The game will be called by Maplewood Richmond Heights graduate Scott Lunte, who was recently hired by radio station KRES in Moberly, MO. Lunte said on Twitter (@Scott_Lunte) that the game can be heard live, online at Centralmoinfo.com. He says to click streaming links under sports tab. 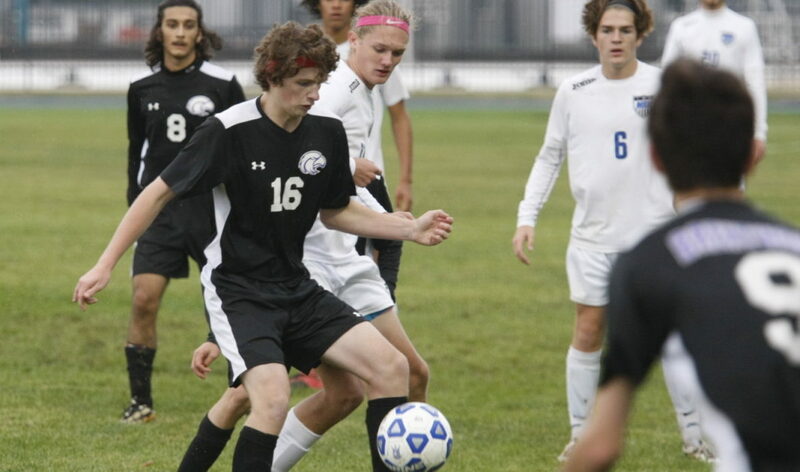 Maplewood Richmond Heights soccer overwhelmed Brentwood in the first half of the Class 1 District 2 final on Thursday, going on to beat the Eagles 6-0. Blue Devils junior Jose Verdia, senior Joseph Barron and junior Issac Pearson each scored one, and sophomore Zach Barton pulled a hat trick — all in the first 40 minutes. The win gave MRH its first district championship in 30 years, and capped off two 20-win seasons in a row. MRH now stands at 20-5. Brentwood finished at 4-16. 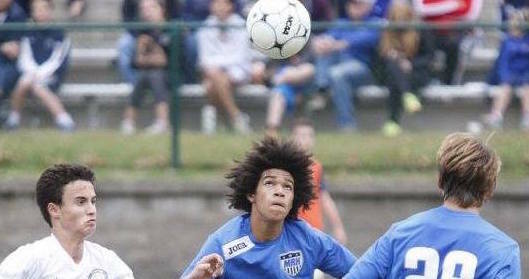 Maplewood Richmond Heights boys soccer kicked off its season with a win. In the first game of a round robin tournament, against DuBourg, junior forward Isaac Pearson scored the only goal of the game, reported by the St. Louis Post-Dispatch. Pearson finished a ball from sophomore Zach Barton early in the game and senior keeper Marlon Ramirez made two ‘highlight-reel saves’ that made the goal stand up for the Blue Devils. The goal was Pearson’s 31st for the Blue Devils. Brentwood football coach John Sappington has announced the football mini camp at Norm West Park next week: Tuesday, Wednesday and Thursday, July 12 ,13, and 14 from 6:30 – 8:30 p.m. Anyone in grades four through eight is welcome. Sappington says this is the 50th year for the Jr. Eagles, and they’ll try to keep it going as long as kids come out. But that was all for the Eagles. Brentwood coach, Mike Imergoot said his pitching was stronger than MRH’s “because we had two strong pitchers and they only had that one.” Junior, Skylar Sappington pitched the full game for the Eagles. In MRH’s semifinal against Hancock, sophomore, Drew Curtis went eight innings and struck out 11 — MRH won it in a walk-off. Brentwood will host Maplewood Richmond Heights baseball Thursday at 4 p.m. in the Class 3 District 4 final at Brentwood Park. It will be the third district final in a row between the two teams; the Blue Devils took the first two. 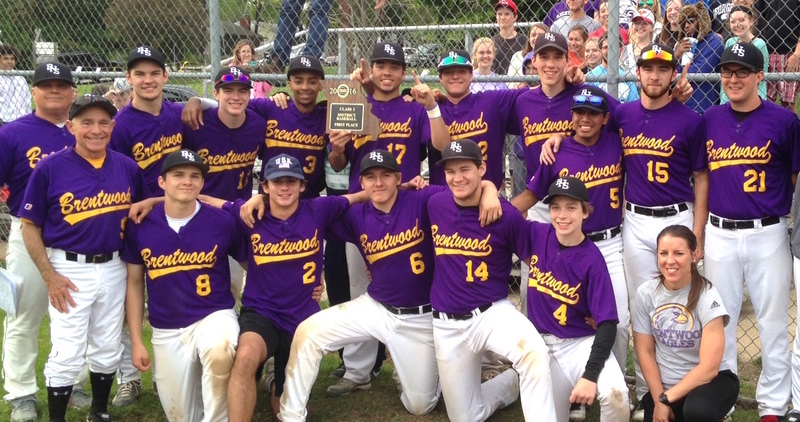 Brentwood defeated Carnahan 10-0 with a six-run first inning Wednesday in the semi-finals at Brentwood Park. Senior Seth Winkleman pitched all seven innings for the Eagles, according to the St. Louis Post-Dispatch. Maplewood Richmond Heights girls soccer finished the season as Class 1 District 2 runners-up on Tuesday, losing in the final to Principia, at Principia, 2-0. MRH defeated Brentwood on Monday, 3-0, with Caroline Barron scoring two, and Sophia Roy with one goal, per St. Louis Post-Dispatch stats. Barron and Roy are both freshmen. Brentwood finished the season at 12-4; MRH at 15-7. “That put us in a tough spot, obviously,” MRH coach Jonathan Webb said. Brentwood girls basketball season ended in the Class 3 semifinal at John Burroughs on Wednesday by a free throw in the last seconds of the game, according to the St. Louis Post-Dispatch. The game was close, with Whitfield leading by two with less than a minute left. With seconds remaining, Whitfield freshman forward Aijha Blackwell pulled down a free throw rebound over Eagles senior Sophia Rivera with 2.9 seconds left, was fouled, and sunk her free throw to win it for the Warriors, 54-51. If Rivera had won the ball, Brentwood senior Abby Harper was alone under the Whitfield basket, waiting for her chance at a game-winning shot. Maplewood Richmond Heights boys and Brentwood girls basketball teams won their first-round Class 3 district games Monday night at John Burroughs to advance to semi-finals. The MRH boys ended Brentwood’s season, defeating the Eagles 68-65. It was the same point spread, also with MRH winning, when they met earlier in the season. MRH will play Whitfield (21-5) Wednesday at 8 p.m. at John Burroughs. The Brentwood girls beat John F. Kennedy 49-27, outscoring them in three quarters. After day one at the state wrestling tournament in Columbia, MO, Maplewood Richmond Heights is tied for 13th place in the Class 1 tournament. Whitfield leads with 38.5. 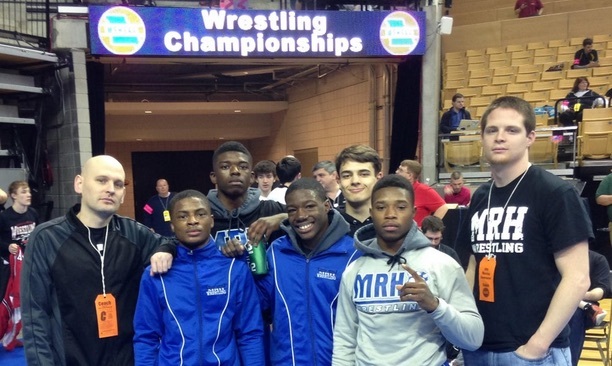 Of the five wrestlers MRH sent to the state meet four have advanced to the second day. 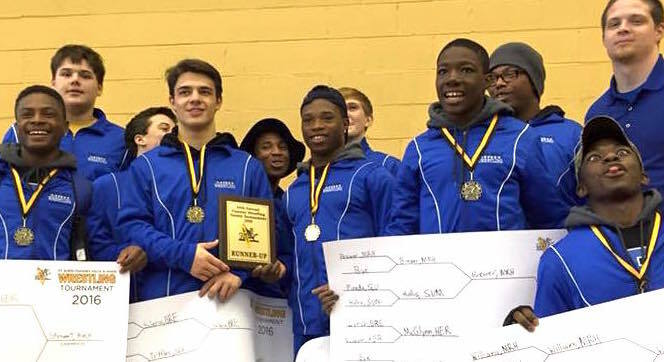 Brentwood qualified six wrestlers for the state meet — none advanced to day two. The state finals are on Saturday. 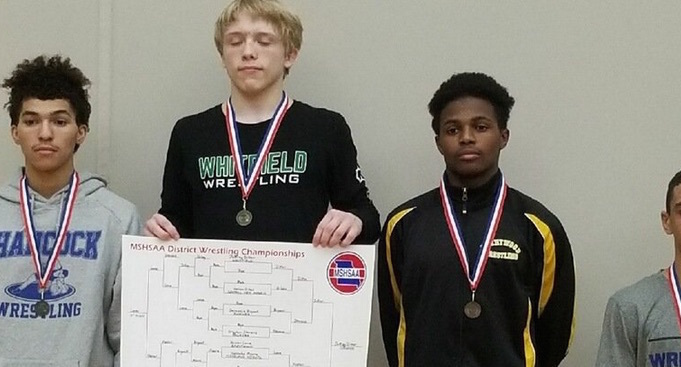 Brentwood and Maplewood Richmond Heights wrestlers, who qualified, faced off for state meet qualification at the district/sectional meet at Whitfield on Saturday. The top four finishers in each weight class will wrestle in Columbia. Brentwood finished in third, with 103.5 team points and MRH took fourth with 99. 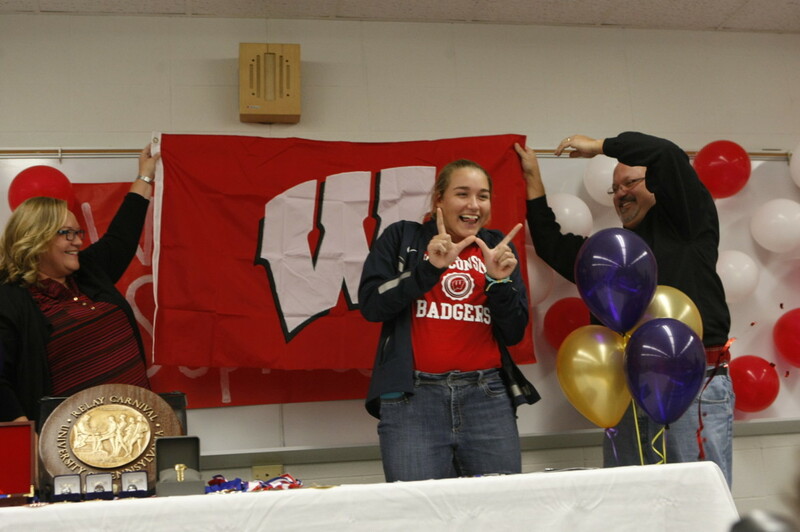 Whitfield won the meet with 240, according to the St. Louis Post-Dispatch. For Brentwood, Deshaun Johnson (152) took first. 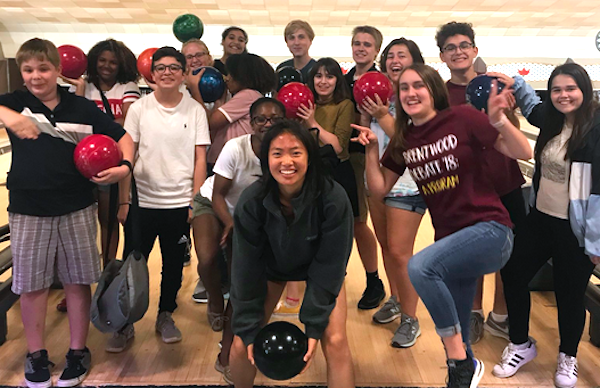 Brentwood assistant principal/athletic director, Stephen Ayotte said, “You absolutely are what all of us want to see in our kids, in our friends. You do the right thing when people are watching. Brentwood senior Jacob Clay leads the St. Louis area with 33 touchdowns on the season. 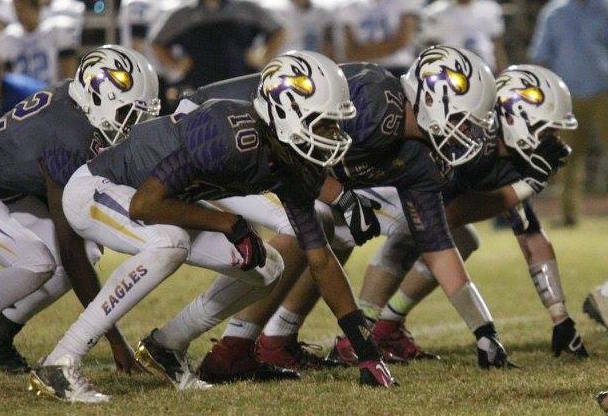 The 8-0 Eagles face Cleveland (1-7) at Southwest Friday in the last game of the regular season. St. Louis Post-Dispatch writer David Kvidahl posted a highlight Hudl video featuring Clay from Brentwood’s home game with Wentzville Liberty on Twitter (@DavidSTLhss). Brentwood Eagles football brings a 5-0 record to Principia (2-3) Saturday at 1 p.m. The St. Louis Post-Dispatch featured senior running back Jacob Clay’s stats on Friday. He leads the area with 21 touchdowns. 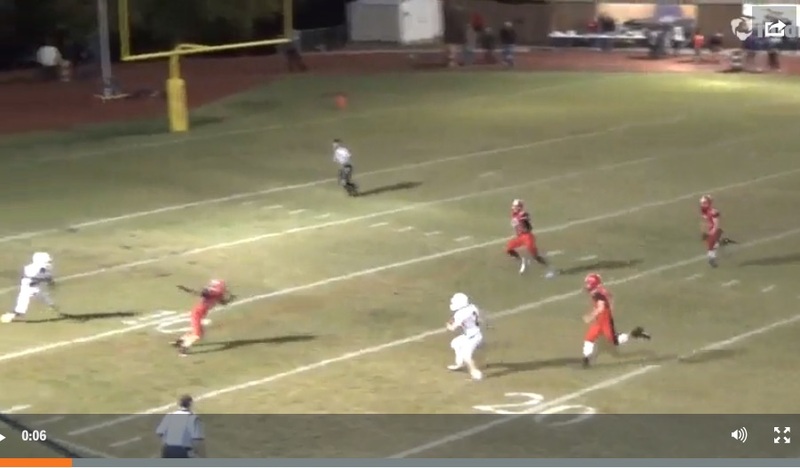 Clay has 984 yards rushing in the Eagle’s first five games. Also, Eagles junior Kaylon Jenkins leads the area in interceptions with five. Brentwood soccer stands at 5-6-1.